Hood River, OR – May 17th, 2016 – Hood River, Oregon based craft brewery, Double Mountain Brewery & Taproom, has selected the Woodstock neighborhood in Southeast Portland, Oregon to open a second taproom location. This marks the brewery’s first expansion outside of Hood River. The new 4336 SE Woodstock location will offer a casual indoor dining environment, as well as outdoor sidewalk seating and large open air windows to be used during the warm summer months. Similar to their Hood River taproom location the interior will feature a custom bar built by local craftsman David Swann, two lounge areas, and chalkboard art. The Portland location will feature a wide variety of their specialty and year-round beers brewed in their brewhouse located in Hood River. The new Double Mountain Portland location will be keeping their renowned menu featuring New Haven style pizza, sandwiches, and salads. They will also offer some new menu items in addition to brewer-crafted cocktails on tap. Like the Hood River taproom, the new location will accept bottle returns for their bottle re-use program and offer beer to-go in bottles, growlers, and kegs. “We’ve wanted a local spot to call home in Portland for some time now, and we love the Woodstock area. We’re incredibly excited to be bringing a full line up of our experimental brews, new draft cocktails (Fast Plane to London is one of my favorites), and a chance to dust off my vinyl collection of old forgotten albums to play on the in-house record player. Plus my band needs a gig in Portland.” said Owner/Brewmaster Matt Swihart. 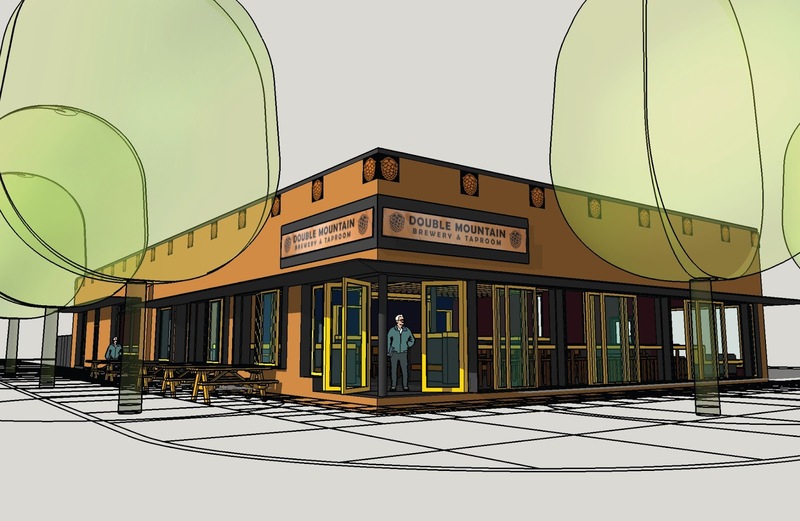 Double Mountain is currently making improvements to the Portland location including; a new artisan pizza oven, kitchen remodel, dining area expansion, and a number of updates to the exterior including an awning modeled after Super Cub aircraft wing. The new location is slotted to be operational coming mid-July. “We are thrilled that Double Mountain chose Woodstock for its Portland location. We’ve been hoping for a great brewpub for years, but getting Double Mountain is like winning the lottery. The brewery’s Hood River home has been a destination for travelers for some time, and we have no doubt that people will come from all over Portland and beyond to sample their great beers and get a taste of our little neighborhood, too.” said President of the Woodstock Community Business Association, Ann Sanderson. Double Mountain is accepting applications for all restaurant staff including servers, hosts/hostesses, bussers, prep-cooks, line-cooks, dishwashers, and managers. Interested applicants can pass on their resumes to woodstock@doublemountainbrewery.com.